6 Flags Over Georgia Holiday Fun! 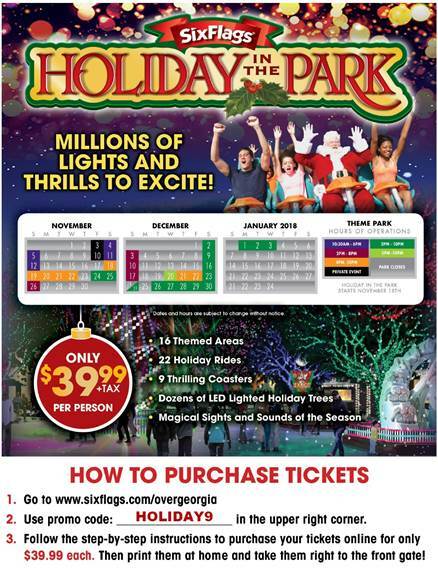 Want to get into the holiday spirit and combine it with some awesome thrills?!? We’ve got just the spot after you’re done touring with us of course…6 Flags Over Georgia! 6 Flags is just about 10 miles West of our shop in Downtown Atlanta and barring traffic you can get there and be parked in 20 minutes, 15 minutes if grabbing a Lyft and getting dropped at the front gate! Having been invited by a friend to come check out the holiday lights during a special Blogger & Media event we entered the park through a sea of twinkling lights and caroling coming from around the soon-to-be-lit tree. The singers were soon met with the MC for the evening who brought up two families to compete in a Christmas song-off where each family had to think quick about their next song. Both families did great and I think easily got to a dozen songs or more, rather impressive! The tree was then lit, “snow” started to fall on this 50 degree November evening in Atlanta and we started to plot our course for food and fun! First tip…download the app so you always have the map & wait times! We headed to grab a bite and tasty libations at JB’s Sports Bar & Grille and cozied up to the bar. On the way we passed through the “Magic of the Season” display with the dancing lights and music, it was awesome! Arriving at JB’s we were greeted by a friendly barkeep and other than possibly needing an additional bartender, it was great to be able to grab a drink and order food there and they do have a quite tasty turkey burger. Then it was time to hit the rides! We started with the classic Monster Mansion, formerly the Monster Plantation, nothing too surprising here, would love to see updates on this one if they can work it into the rotation. Full disclosure, we had every intention of checking out the Retro Christmas USA Holiday Special that the park is doing during the holidays, but with such a short amount of time to spend in the park, we opt’ed for the thrill catching the tree lighting, carolers and light shows along the way. Batman was up first and honestly, I think it’s my favorite, though I go back-and-forth sometimes. It’s just a solid ride and other than wanting it to be longer I put it up there on the list of favorite coasters. 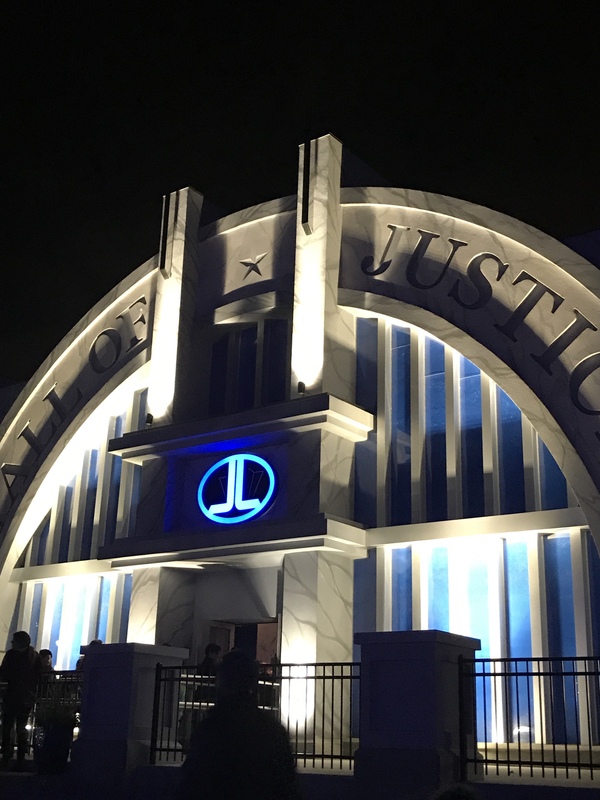 Yes, Georgia is pretty deep in the Marvel Universe when it comes to filming, but DC is alive and well at 6 Flags Over Georgia and while we didn’t make it to the Hall of Justice, Justice League: Battle for Metropolis, this is one not to miss! It’s the newest attraction and stunning from the outside at least. We were pretty focused on the thrill rides and were quickly making our way past the 115-foot dive, s’mores stations, etc. to the back of the park where Superman: Ultimate Flight was awaiting us! This is one of those rides that makes 6 Flags what it is, every one of the coasters having their own special something and Superman’s is that you’re rotated pre-launch to simulate flying. Since I’ve never flown without the use of a device like this before I will hazard a guess it’s somewhat as exhilarating and I could have easily ridden it a few more times, but the s’mores were calling us! 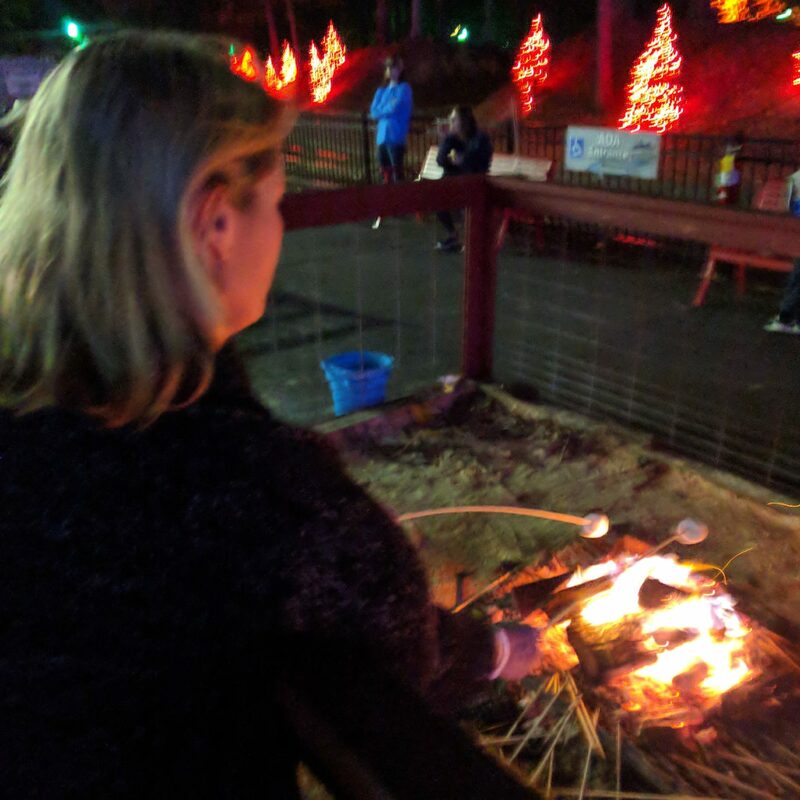 The addition of s’mores stations around the park was a nice touch and while the evening was a bit unseasonably warm it didn’t stop the marshmallow fun! 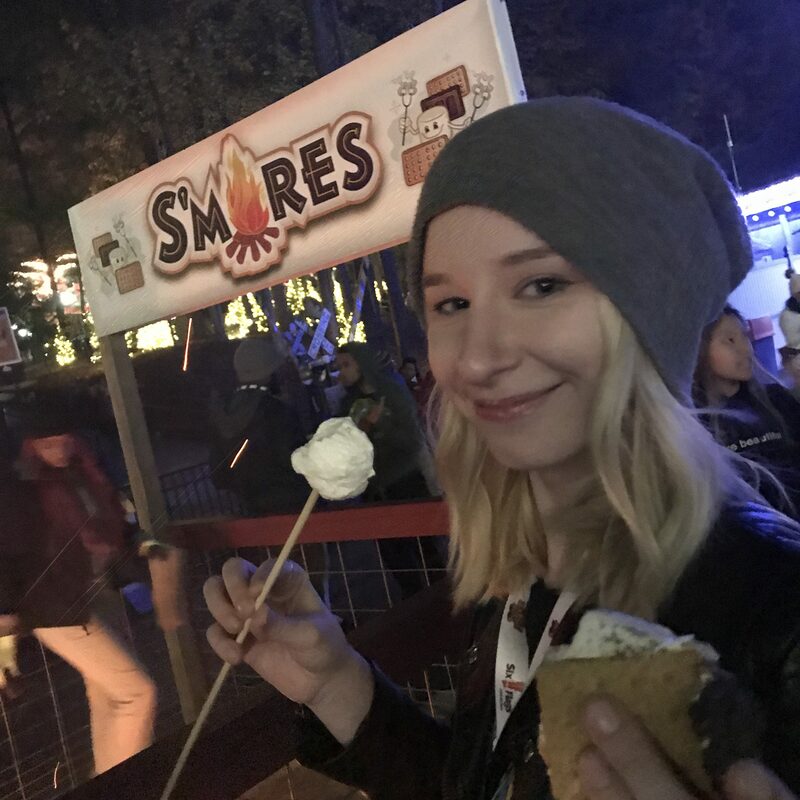 Witness the joy on Emma’s face from s’mores time, LOL! Hot toddy stations could work too on chillier nights…just saying. 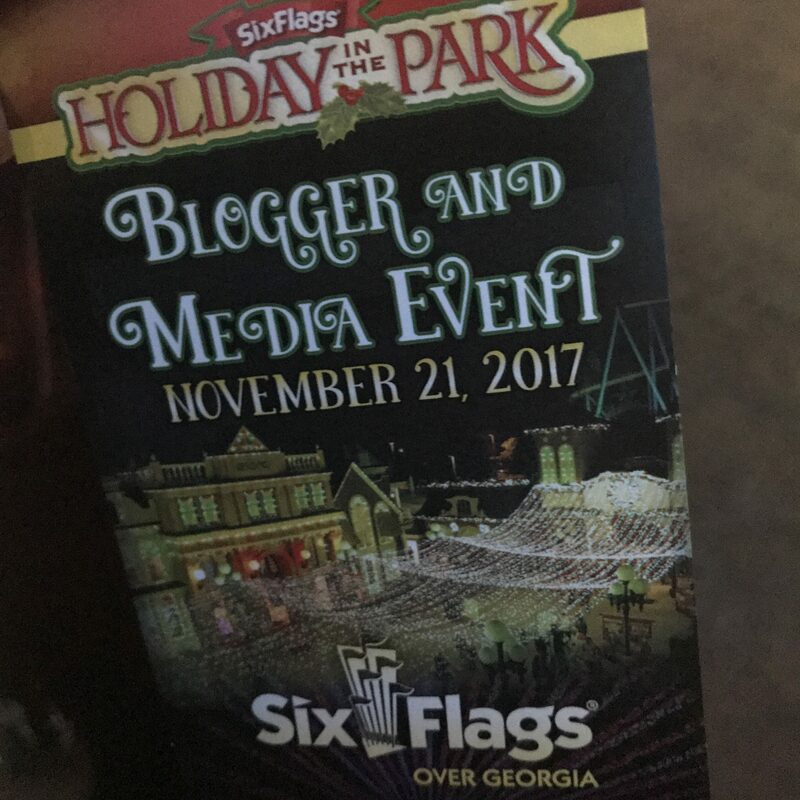 We wrapped up our evening with the Georgia Scorcher, one of the few stand-up rollercoasters around and the 100-foot drop at the beginning gives you a great glimpse of all the twinkling holiday lights. The twists and turns on this one are certainly there, including the 270-degree DNA helix there at the end! Hang on! All-in-all a short, but fun-filled evening checking out the classics and new stuff at 6 Flags Over Georgia!